Olympic sprinter from Jamaica, Usain Bolt, will attempt to break his own record on Sunday, March 31st in the 150 meter race during the Male Olympian race at the Mano a Mano event on Copacabana Beach. Bolt is renowned as potentially the fastest man in the world and currently holds world records in the Olympic 100 meter and 200 meter dashes. 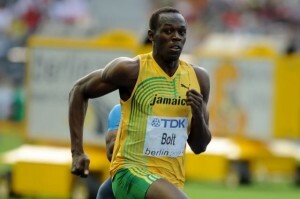 He also set a world record in 20019 for the 150 meter race in the UK at 14.35 seconds. Bolt will be competing against Daniel Bailey from Antigua and Barbuda, Alex Quinonez from Brazil on a special track designed on the beach. The material used for the blue lane track is the same used in the Olympics. After arriving in Brazil, Bolt also participated in a 150 meter race with 8 local children as part of an initiative of the Social Service Industry, who uses sports in order to provide social inclusion and opportunities for children.